Converts wall outlet 100-240V AC to 5V DC voltage. These chargers are normally for tablet Chipsets used: Renesas, Rockchips 2808 / 2818 / 2918, Boxchips (All Winner A10), Infotmic 7″/10″, Vmicro. 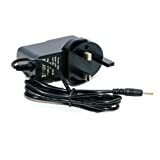 Posts related to UK Mains AC Adapter 5V 2A Power Supply Charger for Android Tablet with 2.5mm plug. This entry was posted in Laptops And Tablets and tagged 2.5mm, Adapter, Android, Charger, Mains, plug., Power, Supply, Tablet by Computer Education World. Bookmark the permalink.